School districts are leveraging the power of the Web to make a difference in student learning, teacher professional development, administrator data management, parental information, and district security. The use of broadband technology and wireless communications are key factors in delivering these opportunities. 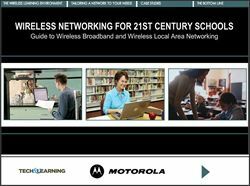 This ebook provides information on effective and cost effective solutions to providing the high-speed wireless access and applications required to enable anywhere, anytime access to the latest tools to improve student learning, provide access to data, and ensure safety and security - today and well into the 21st century.